I en globalisert verden skjerpes kravene til samhandling, samtidig som hendelser skjer plutselig. 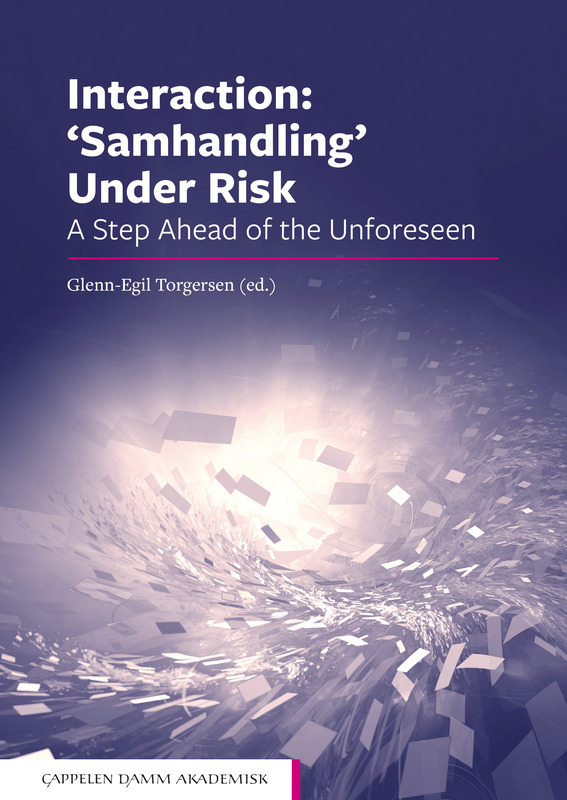 Forfatterne av boka Interaction: ’Samhandling’ Under Risk forklarer hvordan samhandling skapes når betingelsene er uforutsigbare. Den vitenskapelige antologien er et resultat av et stort grunnforsknings- og samhandlingsprosjekt med 32 fremtredende forskere fra ulike forsknings- og utdanningsinstitusjoner i Norge, Sverige og Japan. Det ledende forskningsspørsmålet har vært: Hva er grunnstrukturene i samhandlingsbegrepet under risiko – og hvordan kan samhandling skapes når betingelsene er uforutsigbare? Forskningen er rapportert i 28 kapitler fordelt over 550 sider, og har eksempler fra de fleste sektorer. Boka er derfor aktuell for alle som jobber med beredskap, krisehåndtering og samhandling, i alle sektorer og utdanninger, på alle nivå og vinklinger, både praktisk, teoretisk, strategisk og politisk. Glenn-Egil Torgersen is Professor of Education at the Norwegian Defence University College. He is also Professor II in Education at the University of Southeast Norway, Center of Emergency Preparedness and Integrated Crisis Management. He was formerly a senior researcher in the Department of Man, Technology and Organization (MTO) at the Institute for Energy Technology (IFE). He holds a PhD in Psychology from NTNU (Norwegian University of Science and Technology, Trondheim) and a Master’s Degree (Cand. Polit.) in Educational Science (University of Oslo). In addition, he is a qualified lecturer (Docent) in Organization and Management, and has teaching qualifications in natural science. Key research interests are pedagogical theory construction and practical implications for learning and training design, specifically aimed at professional education in general and emergency-preparedness organizations in particular, in the context of risk, the unforeseen, cyber threats, inter-professional and cross organizational samhandling [interaction]. Johan Bergh is Commander Senior Grade (CDR SG) in the Royal Norwegian Navy. He currently holds the position of Project Manager for “The Digital Age for the Norwegian Defence University College (NDUC)”. Commander Bergh has held positions as Head of Military Leadership Section and Head of Department for Military Leadership and Management. Brita Bjørkelo, PhD, is a clinical psychologist and professor, and teaches in the Leadership and Management Programs, Norwegian Police University College. She is involved in investigations on ethical, grey-area police cases, ethical dilemmas among Senior Investigative Officers (SIOs) and is also involved in several research projects on whistleblowing. Bjørkelo is currently participating in the following projects: “Diversity in Police Education and Organization” and “Gender Representation in Top Positions in Academia”. In addition, Bjørkelo is heading a project on “Teacher Education, Ethics and Social Media”. Ole Boe, PhD, served as Associate Professor in Leadership and Leadership Development at the Norwegian Military Academy from 2003 until 2016, where he led the research project “Character in Military Leaders”. He received his PhD in Psychology in June 2000 from the University of Gothenburg in Sweden. He has previously served as an operational officer in a Norwegian military special unit and graduated from the Norwegian Defence Staff and Command College in 2007. At present, he is Associate Professor of Military Leadership at the Norwegian Defence University College, where he heads the research project “Operational Leadership”. Tone Cecilie Carlsten has worked as a researcher at the Nordic Institute for Studies in Innovation, Research and Education (NIFU) since 2006. Her employment history includes teaching in different countries. She holds a Cand. Polit. (equivalent to a master’s degree) in Educational Science from the University of Oslo and is currently completing a PhD in Educational Science at the same university. She has been a visiting researcher at the University of Illinois and Stanford University. Irmelin Drake, PhD, works as an Associate Professor in Leadership at Kristiania University College, Oslo. Her research interests are focused on leadership in and of organizations, change management, social innovation, gender and diversity. Drake has been involved in numerous research, development and innovation projects related to her research interests and she has co-authored two research-based books on leadership. She received her PhD from the Norwegian School of Economics in 2014, and her dissertation addresses leadership constructions from an internal stakeholder perspective. Odin Fauskevåg, PhD, serves as Associate Professor in the Department of Education and Lifelong Learning at the Norwegian University of Science and Technology (NTNU). His field of research interest is mainly theoretical, specifically concerning how the German philosophical tradition may shed light on different aspects of modern educational practices. A central theme is how thinkers like Hegel, Kant and Gadamer, and concepts such as Bildung and recognition, define a framework for discussing education that differs from the competency-based educational thinking which prevails today. Kristian Firing holds a PhD degree and currently serves as Associate Professor at the Royal Norwegian Air Force Academy and at the Institute of Teacher Education at the Norwegian University of Science and Technology. Firing has a great passion for teaching. He loves to contribute to the students’ learning process. Beyond the classroom, he likes to bring art-based methods of learning into other contexts, such as military exercises. In his coaching, he tries to practice “the art of meeting”, walking through the learning process together with the students, leaving them with increased self-efficacy. Pål Kristian Fredriksen is a major in the Royal Norwegian Air Force. He has a background as an F-16 pilot in the 338 Squadron, and has military experience from international operations in the Balkans and Afghanistan. Fredriksen holds a Master’s Degree in Management from the Norwegian University of Science and Technology. At present, he holds the position of Section Commander for Supervision, Exercises and Training at the Royal Norwegian Air Force Academy. Kjersti Halvorsen is Associate Professor and PhD in Public Administration. She teaches in the Master’s Program in Organizational Leadership at the Western Norway University of Applied Sciences. She has explored the idea of modernization: 1) in the first classical texts of organizational theory; 2) in the political programs of the Scandinavian welfare-state pioneers; and 3) in interviews with the management consultants who introduced New Public Management to Norway. One of her recent projects focuses on suicide amongst patients undergoing treatment at psychiatric hospitals. Halvorsen has been a visiting scholar at SCANCOR Stanford University and the Stockholm School of Economics. Gila Hammer Furnes is Assistant Professor and Ph.D. Research Fellow at Western Norway University of Applied Sciences. Her work is related to digital samhandling [interaction] in education, teacher education, and samhandling between the areas of research and practice in education. Her PhD project aims to develop empirically-based knowledge about samhandling with regard to research and development projects in educational practice. Specifically, it examines how school researchers and teachers in joint school research and development projects perceive samhandling. Berit Kristin Haugdal holds a Cand. Paed. (equivalent to a master’s degree) in Educational Science from the University of Oslo, and is currently Quality Leader at the Norwegian Military Academy (Krigsskolen) in Oslo. Her work is focused on quality and professional development in the education of officers, and studying the similarities between doctrines and curricula in the light of teaching, learning and training students of any kind. Tormod Heier er oberstløytnant i Hæren, fagbokforfatter og ansatt ved seksjon for utvikling og lederstøtte ved Forsvarets stabsskole. Heier har militær utdannelse fra Krigsskolen og Forsvarets høgskole, samt mastergrad fra King's College London og doktorgrad fra Universitetet i Oslo. Marius Herberg is Lieutenant Colonel in the Royal Norwegian Air Force and a PhD Research Fellow at the Department of Military Leadership and Management, Norwegian Defence University College. The PhD program is located at the Norwegian University of Science and Technology (NTNU) in Trondheim, Department of Psychology. “Competence for the Unforeseen” is the overall theme of his doctoral dissertation. He has operational and administrative experience from various roles and levels within the Norwegian Armed Forces. In addition, he has experience from the Norwegian Ministry of Defence and international service in the Balkans. Hitoshi Kawano is Professor of Sociology at the Department of Public Policy, and Director of the Center for International Exchange at the National Defense Academy in Yokosuka, Japan. He received his PhD from Northwestern University in 1996. His research interests include military history, the sociology of combat and peacekeeping, mental health, family support, gender mainstreaming and diversity management issues within the defense forces, and civil-military relations in post-Cold War Japan. His publications include “Combat Leadership on Guadalcanal: In Extremis Leadership of the Japanese and American Soldiers in World War II” in Leadership in Extreme Situations, (M. Holenweger et al. eds. 2017). Olav Kjellevold Olsen has served as a military officer for 29 years and is currently Associate Professor at the Department of Psychosocial Science at the University of Bergen. Olav holds a Master’s Degree in Theology and a PhD in Psychology. He has published works on operational leadership, operational morals, organizational justice, operational training, addiction in the military, sleep deprivation and operational performance, team performance, psychological resilience, and trust in operational leadership. Tommy Krabberød, Commander and PhD, graduated from the Royal Norwegian Naval Academy in 1995. He has served on board Oslo Class frigates and has worked as a lecturer on leadership at the Norwegian Naval Academy since 2003. His most recent papers are “Task Uncertainty and Mission Command in a Naval Context” and “Auftragstaktik zur See - An Impossibility?” His main research interest is leadership and organization in a naval context. Tore Listou is Associate Professor of Logistics at the Norwegian Defence University College and Adjunct Lecturer at the Swedish Defence University. He holds a PhD in Logistics from Lund University (Sweden); an MSc in Business Administration from the Norwegian School of Economics and Business Administration (NHH), and an MBE from BI Norwegian School of Management. His research interests are related to defense logistics and humanitarian logistics, focusing on preparedness and responsiveness. He is currently head of the multinational MCDC project Global Integrated Logistics for Rapid Aggregation. Listou has ample experience from teaching and tutoring in logistics at universities in the Nordic countries. Leif Inge Magnussen (PhD) is engaged in his research interests: learning trajectories, effects of training, leader development, evaluation and decision- making. He currently holds the position of Associate Professor at University of Southeast Norway (from 2011) and Manager at the Center of Emergency Preparedness and Integrated Crisis Management. Furthermore, he is the elected President of the Norwegian Mountain Guides Association. His former positions were at the Norwegian School of Sport Sciences and the Norwegian Police Academy. Ingrid Nyhus has a Master’s Degree in Educational Psychology, and her thesis focused on the treatment of young people for trauma after the Tsunami catastrophe of 2004. In her position as Adviser at the Norwegian Defence College, she has immersed herself in the topic of how supervision can be used and developed in different training situations. In her current position as Project Manager of the Norwegian Seamen’s Church, she supports different organizations in emergency-response preparedness. Ann Christin Rivenes is a psychiatrist and Head of Department of Psychosomatic Medicine, Psychiatric Clinic, Haukeland University Hospital. She has long experience in consultant-liaison psychiatry and with crises and emergency management. Torbjørn Rundmo has a Graduate Degree in Psychology (Cand. Psychol.) from the University of Bergen (1983) and is a chartered Clinical Psychologist by the Norwegian National Board of Health. He has a doctoral degree (Dr. Philos.) from the Norwegian University of Science and Technology (1993) and was made honorary doctor (fil.dr. honoris causa) by the Stockholm School of Economics in 2005. Rundmo is Appointed Member of the Academy of the Royal Norwegian Society of Science and Letters (DKNVS). He is Member of the Scientific Boards of Journal of Risk Research (published by Routledge, Taylor & Francis), Safety Science (published by Elsevier), and the International Journal of Quality, Statistics, and Reliability (published by Hindawi). Since 1999, he has been Professor of Community Psychology at the Norwegian University of Science and Technology. From 1998-1999, he was also Professor of Work and Organizational Psychology at the same university. Per Øystein Saksvik has been a professor at the Department of Psychology, Norwegian University of Science and Technology since 2001. He received his PhD in 1991 in Occupational Health Psychology from the same institution. He has ten years of experience as a contract researcher. He does research in occupational health and safety, organizational interventions, sickness absenteeism and presenteeism, and organizational change. Marianne Storm, Professor, PhD, M.Sc., RN, is currently Norwegian Harkness Fellow (2017-18) in Health Care Policy and Practice at Dartmouth College, New Hampshire, USA. She is Professor at the Faculty of Health Sciences at the University of Stavanger (UiS), Norway. She is part of the UiS Centre for Resilience in Healthcare. Storm has been the principal investigator and co-investigator on several research projects which have received grants from the Norwegian Research Council. Herner Sæverot er professor dr.philos. i pedagogikk ved Institutt for pedagogikk, Universitetet i Bergen. Han er også professor II i pedagogikk ved Kunsthøgskolen i Bergen. Sæverots primære forskningsinteresser inkluderer allmenne pedagogiske spørsmål, pedagogisk danning, eksistensiell pedagogikk, og litteratur og pedagogikk. Han har publisert flere bøker og vitenskapelige artikler, i både nasjonal og internasjonal sammenheng. Sæverot er også medlem av Dannelsesutvalget ved Universitetet i Bergen. Carl Cato Wadel (f. 1960) er dr.philos. med hovedfag i sosialantropologi. Han er førsteamanuensis ved Institutt for medie-, kultur- og samfunnsfag ved Universitetet i Stavanger. Hans forskningsinteresser knytter seg til organisasjonsendring, ledelse og medarbeidersamhandling. Tobias Werler er professor ved Seksjon for pedagogikk ved Høgskolen i Bergen. Siri Wiig holds a PhD, MSc, and is a Professor of Quality and Safety in Healthcare Systems at the Faulty of Health Sciences at the University of Stavanger (UiS), Norway. She is part of the research center SHARE - Centre for Resilience in Healthcare, UiS. Key research interests are resilience in healthcare, patient safety, quality improvement, user involvement, human factors, risk regulation, leadership, learning, socio-technical systems, and welfare technology. Wiig has been member of two national public commissions reporting to the Ministry of Health and Care Services (2013-2015) and the Ministry of Defence (2015-2016).